Arrive in Quito. 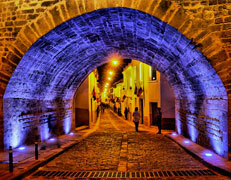 Meet and greet with your bilingual guide; then transfer to the boutique hotel Patio Andaluz (4*). On the way you will receive some fruit, refreshing towels and drinking water.Two nights, (double occupancy), including breakfast, hotel tax and service charge. Around 10PM, your guide will pick you up to start the city tour with a visit of the Itchimbia neighborhood, offering a spectacular view of the old and new city. Then you will visit the old colonial Quito, starting in Santo Domingo Plaza walking through one of the oldest streets in town, “La Ronda Street,” where you will see the colonial architecture and how the Quiteños lived in the 17th century. Your walk takes you through the city museum to San Francisco Plaza, making a quick stop to enjoy the typical sweets of Quito. San Francisco is the oldest church in Quito and it is full of history and legends. Next, you will visit La Merced church, which is constructed in the arabesque and baroque style of architecture. Finally, a visit to the main square where the presidential palace,the main cathedral and some other important buildings can be appreciated. La Compañía de Jesus church is one of the most beautiful churches in South America, or perhaps, in the world. This is the final treasure to be visited on our program before your guide takes you to lunch. Lunch will be served at the Cuchara de San Marcos, a local restaurant that offers vegetarian & organic cuisine with a colonial ambiance. Afterwards, transfer to one of the most complete spas of the city for a 1 hour tropical fruit massage. Your driver will pick you up and transfer you to your hotel. Today your guide will take you to Cotacachi – Cayapas National Park, to thrill at the beautiful paramos (the ecosystem of the Andes). This entire area is endowed with beautiful landscapes accented by the presence of the Andes. 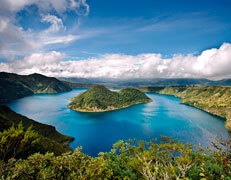 Continue on to Cuicocha Lake for a guided hike while you learn about the flora and fauna of this region. 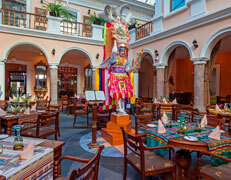 After your hike, a brief visit to Cotacachi (the leather town) is followed by lunch at Hacienda Hosteria La Mirage (4*). After lunch you will enjoy the magical experience of a Shamanic spiritual cleansing (optional activity that has to be reserved in advance). The Shamans possess great vision for the countryside and, in particular, for healing plants. The female Shaman at La Mirage possesses great healing powers inherited through years of experience from her father, a recognized Shaman in this region. As we travel into the highlands, we are treated to a sweeping view of Imbabura and Cotacachi Volcanoes rising above San Pablo Lake. You will start the visit of the main market in Otavalo, which dates back thousands of years and is famous throughout the Andes for its handicrafts, textiles and tapestries. A Healthy lunch, prepared with the vegetables of their own orchard, will be served at Sacha Ji (4*). This new eco-friendly hotel offers intercultural, ecological and spiritual activities such as Healing Therapies, Yoga classes, and medicinal plants workshops, all while enjoying the marvelous view of the San Pablo Lake and the Imbabura Volcano. This afternoon, take part in a Kundalini Yoga Class with certified KRI (Kundalini Research Institute) bilingual yoga instructors. The rest of the afternoon is free to explore the area or just relax. One night, (double occupancy), including breakfast, hotel tax and service charge. After a healthy breakfast and a short time to enjoy the surroundings of Sacha Ji, we will leave for Peguche, where native weavers demonstrate their craft, as they have for centuries. Continuing on to Papallacta, we will have lunch en route in Cayambe at “Hacienda La Compania” and their rose plantation. This gorgeous property originally belonged to the Jesuit. First, you will be shown around the spectacular rose plantation. Ecuador’s roses are perhaps the best in the world, and the flowers at Hacienda La Compañía clearly demonstrate why. You will learn about the entire process, including growing, harvesting, packing, and shipping. The house itself was constructed in 1919 in a French Republican style, and the interior is lavishly decorated with antiques and incredible rose displays. Lunch will be served at one of the dining rooms of the property. 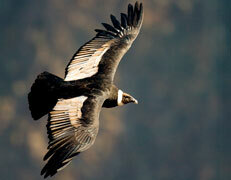 Afterwards we will take our road to Papallacta which is the habitat of the condor, the puma, bears, and other wildlife. The “Termas de Papallacta” (Papallacta Thermal Springs) Hacienda owns the “Rancho del Canon,” a protected area of 250 hectares (625 acres) located at the entrance of the ecological reserve, Cayambe-Coca. The Papallacta River crosses both the hacienda as well as the high section of the valley, offering the visitor a spectacular view of the Antisana Volcano. In this beautiful area, we offer walks along the nature trails to appreciate the local flora and fauna. With more than 160 different species of birds, including hummingbirds, tanagers and occasionally the great Andean Condor, this area is a treasure for ornithologists. Afterwards, enjoy the Hot Springs of Papallacta, whose thermal waters emerge from deep geological layers through fissures up to the surface. This will be a day of nature, health and relaxation. 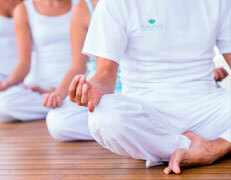 A relaxing massage (45 minutes) is also included this day. After lunch you will return to Quito. Two nights at Patio Andaluz (double occupancy), including breakfast, hotel tax and service charge. We will depart in the morning for the southern region of Ecuador, traveling through the Avenue of the Volcanoes. Today we share in the wisdom of Don Alberto Taxo, a master Iachak of the Atis (Kichwa) people from the Cotopaxi region of Ecuador. Don Alberto received the highest honor of Master Iachak by the Shamanic Council of South America. He generously shares ancient Andean wisdom and practices with people who seek happiness, balance and fulfillment. Don Alberto’s "Encuentros" provide advanced training to those who wish to experience the present moment through connection with the elements—earth, air, fire, water and Ushai. These residential programs penetrate deeply, shattering cultural and genetic programming, and enabling us to move with power and grace into the times to come. We will enjoy typical meals prepared in the traditional way with local products. Return to Quito in the evening. Note: Please wear comfortable clothing and keep an open mind, considering this is a very local experience.